JEFFERSON CITY, Mo. — With the special session to explore potential disciplinary action against Gov. 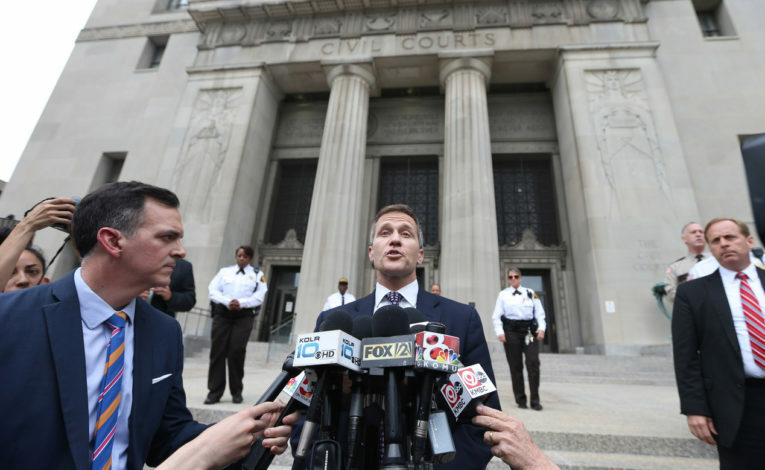 Eric Greitens days away from starting, the embattled governor wants proceedings to mirror a criminal trial. A letter sent by Edward D. Greim, partner at Graves Garrett, the law firm hired to represent the governor in potential impeachment proceeding; to Rep. Jay Barnes, the chairman of the House Special Investigative Committee on Oversight; and the House of Representative puts forth a potential timeline and requests certain procedures be followed. “…both branches of the government share a common interest in arriving at the truth in a way that does justice to the gravity of this unique moment in the history of our constitution and our state,” the letter sent May 11 states. The governor’s defense wants a list of all subject matters the committee is investigating, the ability to attending all proceedings — including hearings and meetings —, the ability to cross-examine all who testify, the ability to present their own witnesses — with subpoena power, and the ability to present documentary evidence. “Additionally, we respectfully propose a timetable that will allow proceedings to be completed within thirty days of May 18, 2018,” and “provide ample opportunity for the Committee to carefully consider reliable evidence,” the letter states. “This seems more like a proposal for the trial. House process is the investigative/charging phase. Normally wouldn’t allow accused to cross examine at this stage or to see evidence. But after house votes, this schedule seems appropriate,” Chuck Hatfield tweeted on Tuesday morning. The Missouri Constitution lays out the process for impeachment in Article VII, Sections 1 and 2. The special session is set to begin on Friday at 6:30 p.m. In preparation for potential impeachment proceedings, Senate President Pro Tem Ron Richard has reportedly looked at potential judges to serve on the jury of which the impeachment would be tried.